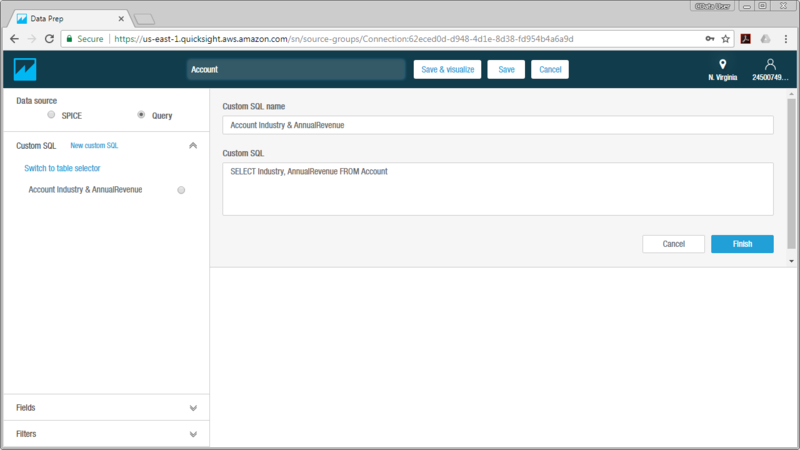 Learn how to connect to NetSuite and build visualizations of NetSuite data using a MySQL Connection in Amazon QuickSight. 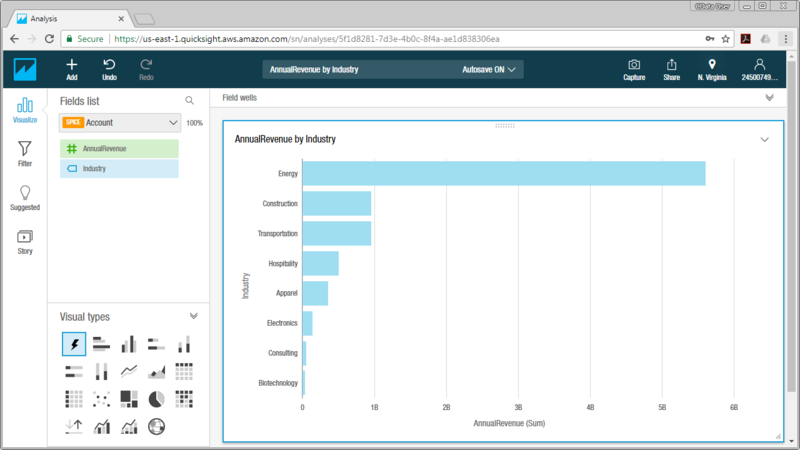 Amazon QuickSight gives you a way to quickly build visualizations, perform analytics, and get insights from AWS data sources, uploaded files, and other databases in the cloud. When paired with the CData SQL Broker, you get the same functionality with access to 100+ big data, NoSQL, and SaaS sources, both on-premises and in the cloud. 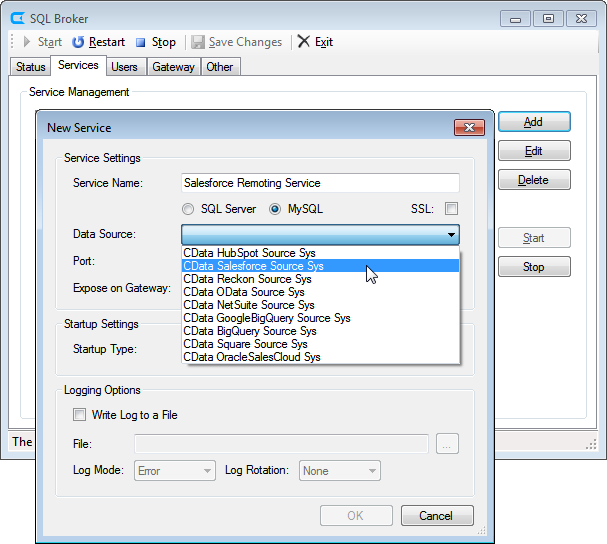 In this article, we use the SQL Broker with the CData ODBC Driver for NetSuite to access NetSuite data through a MySQL connection in Amazon QuickSight, either in real-time using direct queries or by importing the data into SPICE. If you have not already done so, provide values for the required connection properties in the data source name (DSN). You can use the built-in Microsoft ODBC Data Source Administrator to configure the DSN. This is also the last step of the driver installation. See the "Getting Started" chapter in the help documentation for a guide to using the Microsoft ODBC Data Source Administrator to create and configure a DSN. The User and Password properties under the Authentication section must be set to valid NetSuite user credentials. In addition, the AccountId must be set to the Id of a company account that can be used by the specified User. The RoleId can be optionally specified to log in the user with limited permissions. See the "Getting Started" chapter of the help documentation for more information on connecting to NetSuite. See the SQL Broker Overview to set up connectivity to NetSuite data as a virtual MySQL database. You will configure a MySQL remoting service that listens for MySQL requests from clients. The service can be configured in the SQL Broker UI. The IP address or domain name of the machine hosting the SQL Broker. The data source name (likely CData NetSuite Source Sys) of the MySQL service. The port number of the MySQL service. The credentials of a SQL Broker user with access to the service. 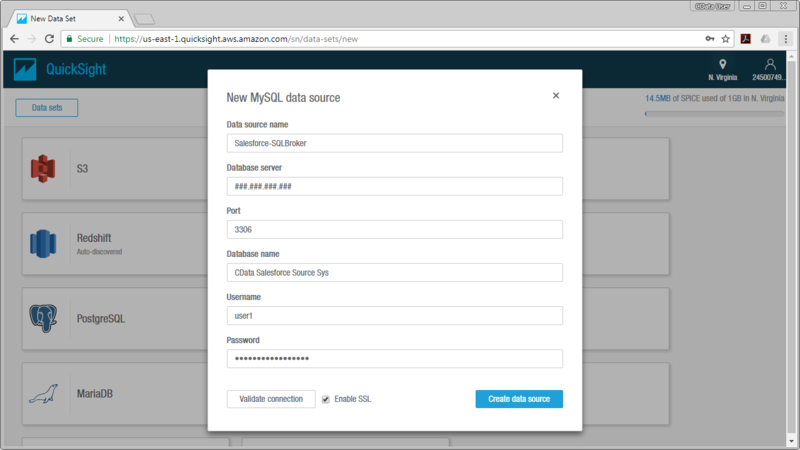 Once you have a MySQL Service configured for the NetSuite ODBC Driver, you are ready to connect to the data in QuickSight. Start by logging in to your QuickSight console. From there, click Manage Data, then click New Data Set and choose MySQL as the data source. Configure the dataset using the values for the MySQL service for NetSuite you configured in SQL Broker (be sure to use the DSN for the database name). Validate your connection and click Create Data Source. Name your dataset (for example, SalesOrder). If you wish to import your data into QuickSight SPICE, click the SPICE option; otherwise, QuickSight will query the data directly. Under the Tables menu, click Switch to Custom SQL Tool. Give your SQL query a name. After you have saved the dataset, you can configure the visualization. Select the columns you wish to visualize and choose a visual type. Your visualization can be customized from its name to the way that data is aggregated. 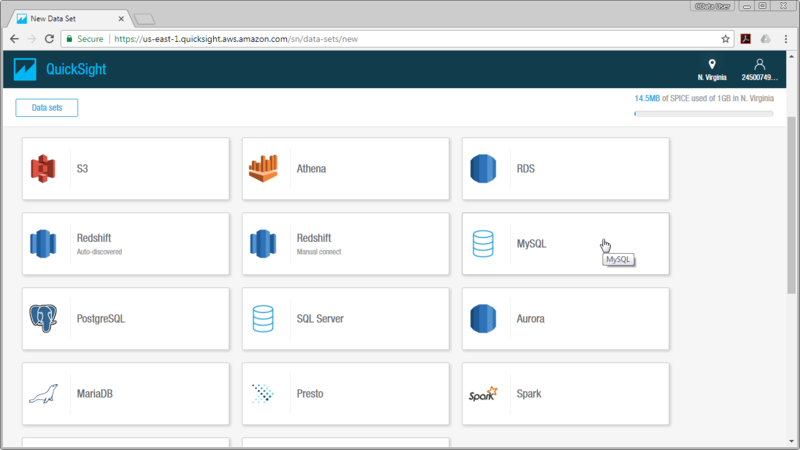 With the CData ODBC Driver for NetSuite and SQL Broker, you are able to easily build data visualizations and perform analytics on NetSuite data in Amazon QuickSight. If you have any questions, such as needing to access your on-premises data from AWS QuickSight, let our Support Team know.